We investigated the ability of a bacterial community constructed with six strains isolated from an oily sludge, to utilize diesel oil at high concentrations. The consortium was able to grow at concentrations up to 84 g diesel oil/L and had produced biosurfactants during its active growth phase; these compounds, in their crude form, reduced the surface tension of distilled water from 72 mN/m to 31 mN/m, with a corresponding Critical Micelle Concentration value γCMC = 81 mg/L. The plot of specific growth rates obtained from the growth curves versus initial concentrations was found to fit adequately the experimental data by the Andrews inhibitory model, which resulted in the following kinetic constants: μmax = 0.535d−1 ± 0.063, KS = 18.68 g/L ± 3.59 and KI = 29.02 g/L ± 4.96, reflecting the slow biodegradation rate. At 25.2 g diesel oil/L, close to the optimal concentration S* = 23.28 g/L ± 4.23, the consortium metabolized diesel oil faster than each strain did individually, suggesting that the process was stimulated by a synergistic interaction between the members of the consortium. 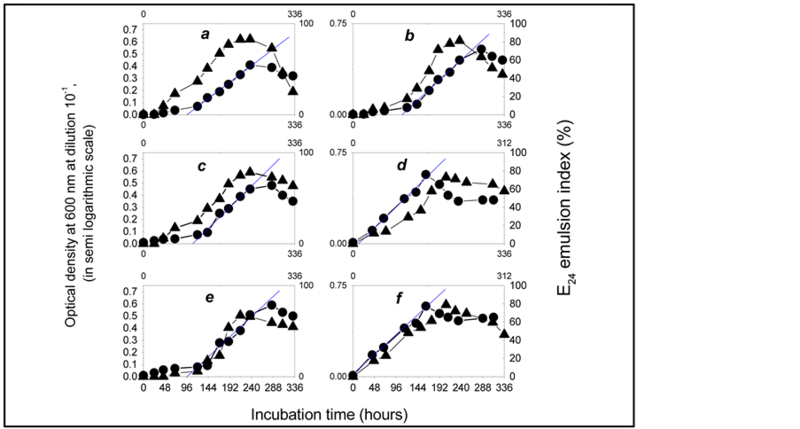 The specific growth rate expresses the ability of a bacterial population to increase under favorable conditions: the change depends on the population as well as time following the equation: where is the bacterial abundance estimated after an incubation time , and . The relationship between the specific growth rate and the concentration of a substrate is regarded as an essential tool in all fields of microbiology, physiology, genetics, ecology or biotechnology  . Such relationship between the specific growth rate of a microbial pure culture and the concentration of a single substrate was formulated initially by Monod  as follows: , where is the maximum growth rate constant and , defined as the substrate concentration at which , is the saturation constant for the microorganism, substrate and cultural conditions specified. Later, Andrews  has proposed a mathematical model (known as Monod modified or Haldane-Andrews model) using an inhibition function to relate substrate concentration and specific growth rate as follows: , where is an inhibition constant. The Andrews model is considered as one of the most commonly used models for describing the growth inhibition kinetics of microorganisms  . The abilities of certain bacteria to utilize diesel oil as growth substrate have been extensively studied using a variety of microorganisms  - . In the present study, we used a defined bacterial community, reconstructed with six strains isolated from a residual oily sludge collected from a diesel oil storage tank, in order to model mathematically the growth of the microbial consortium using diesel oil as the carbon and energy source. The aim of the study is to define optimal conditions for the elimination of pollutants generated by the petroleum industry and to avert a possible deterioration of diesel oil quality during storage. The bacterial consortium was isolated by selective enrichment from a residual oily sludge collected from a diesel oil storage tank located in an oil refinery. Diesel oil was used at high initial concentration as the substrate to enrich the prevalent species. One gram of this sludge was added directly to a 500 ml-Erlenmeyer flask containing 100 ml of mineral salts medium (MSM) supplemented with 0, 1% (v/v) of diesel oil (bought from a service station). The MSM used for all incubations contained (per liter of distilled water):10 g KH2PO4, 3 g K2HPO4, 2 g NH4NO3 (major salts solution A) and 0.3 g MgSO4 (7H2O); 0.1 g NaCl; 10 mg CaCl2; 1 mg MnCl2; 1 mg CuCl2, 1 mg FeSO4, 1 mg ZnSO4 and 0.1 mg MoO3 The pH of the solution A was adjusted to pH = 7 with NaOH before autoclaving (120˚C, 20 min). The other elements were sterilized separately (120˚C, 20 min) and added aseptically, after cooling at room temperature, to solution A to form MSM. Culture was incubated aerobically on a rotary platform shaker operating at 100 rotations/min (rpm) (Janke & Kunkel, IKA-WERH, KS 500). Diesel oil was used as the substrate to enrich the prevalent species: the enrichments were transferred four times at a 10% (v/v) inoculum into 500 ml-Erlenmeyer flask containing 90 ml of MSM supplemented with 1% (v/v) diesel oil (=8.4 g diesel oil/L). The enriched bacterial consortium was identified to contain six bacterial strains. The microorganisms were isolated as pure cultures by the conventional streak-plate technique and transferred to liquid cultures. A preculture was carried out in 250 ml-Erlenmeyer flask containing 50 ml of MSM with diesel oil at the concentration 0, 25% (v/v). The flask was incubated during 48 hours at 27˚C under 100 rpm rotary shaking. 8 ml of the preculture were inoculated into 500 ml-Erlenmeyer flasks containing 100 ml of MSM added with diesel oil at the concentration ranging from 1% to 10% (v/v). The flasks were incubated at 27˚C under 100 rpm rotary shaking. Growth was followed during the intervals between sampling by the measure of the optical density (OD600) of culture sample diluted at 10−1, by means of the spectrophotometer MF 320 N DO (JOUAN S.A-FRANCE); due to the poorly soluble nature of diesel oil in water, the measures were achieved as described in  . All experiments were performed in duplicate. Activity assays were done in duplicate and plotted as mean values. , which allowed for direct conversion of measurements to viable cells concentration: 0.1 unit of the culture medium represents 43 × 108 UFC/ml. The resulting product was extracted from the cell-free culture supernatant as described in  . It is well known that the bacterial concentration is proportional to the optical density of the culture medium sufficiently diluted (Beer-Lambert law). As the bacterial abundance is expressed as the of bacterial culture samples diluted at 10−1, measured in a semi-logarithmic scale, to determine the exponential growth rate for each initial concentration S of diesel oil tested, we have to consider the linear part of a plot of versus incubation time, where and . Using the plotting program “fit linear” of the software “Origin 5.0” (Microcal software Inc.) we determine , from the fitted equation: . The emulsifying activity in the culture medium was estimated as described in Cooper and Goldenberg  . The surface tension of the crude extract was measured with a tensiometer CSC-DUNOUY 40902 using the ring technique: the E24 emulsion index is considered as most suitable for the measure of biosurfactants emulsifying activity  . The 16S rRNA gene sequences of Pseudomonas citronellolis strain KHA and Serratia marscecens LHA have been deposited in the GenBank database under accession numbers EF 593111 and EF 616470, respectively. Diesel oil is a complex mixture of hydrocarbons which consists mainly of linear and branched alkanes that are highly variable in susceptibility to biodegradation. We were interested in investigating the concentration dependency of diesel oil metabolism rates for the six bacterial strains cultivated as pure culture, then as mixed bacterial culture. The results are shown in Figure 1 and further details are given in Table 1. Figure 1 shows that all isolates were able to grow on diesel oil, and have produced bioemulsifier compounds during the active growth phase: Pseudomonas citronellolis has exhibited the best emulsifying activity, followed by the strains AM and FFH. Compared with others members of the consortium, the strains KHA and AM express the best biological activity against the diesel oil (μ = 0.177 d−1 and μ = 00174 d−1, respectively). The active growth phase of the strain KHA stops after 117 hours of incubation, while that of the other strains ceases only after 235 hours, and up to 307 hours for the strain MH: this suggests that strain Pseudomonas. citronellolis KHA has a specialized niche in the hydrocarbons degradation by the consortium. It should be noted that the strain KHA starts its active growth phase after a very short lag phase, which means that the cells have synthesized all the enzymes that they needed for growth, in proper amount, during the preculture at 0, 1% (v/v) diesel oil. In contrast, the others isolates needed a lag phase much longer, especially MH and NE1. The results are shown in Figures 2 and 3, and further details are given in Table 2. Table 1. Specific growth rates calculated for the members of the bacterial consortium growing with 25.2 g diesel oil/L. KHA: Pseudomonas citronellolis; LHA: Serratia marcescens; FFH: Micrococcus luteus; MH: Pseudomonas spp. AM and NE1: Gram-negative, rodshaped and motile bacteria. Figure 1. Growth curves (●) and emulsifier production measured as E24 emultion index (∆) expresses by each member of the bacterial consortium cultivated with 25.2 g diesel oil/L. KHA: Pseudomonas citronellolis; FFH: Micrococcus luteus; LHA: Serratia marcescens; MH: Pseudomonas spp. AM and NE1: Gram-negative, rod-shaped and motile bacteria. Figure 2.Growth curves of the bacterial community using diesel oil as the sole carbon and energy source, at the initial concentration. a: 1%; b: 2%; c: 3%; d: 4%; e: 5%; f: 6% (v/v). ●: OD600 of the bacterial culture medium diluted at 10−1. ▲: Emulsification activity (measured as E24 emulsion index of the bacterial culture medium). Table 2. Specific growth rates corresponding to bacterial community calculated for the initial concentrations of diesel oil ranging between 1% - 10% (v/v). cescens LHA, Micrococcus luteus FFH, Pseudomonas spp. MH and two Gram-negative, rod-shaped and motile bacteria AM and NE1. Figure 3. Growth curves of the bacterial community using diesel oil as the sole carbon and energy source, at the initial concentration. a: 7%; b: 8%; c: 9%; d: 10% (v/v). ●: OD600 of the bacterial culture medium diluted at 10−1. ▲: Emulsification activity (measured as E24 emulsion index of the bacterial culture medium). Figures 2 and 3 show that the proliferation of the microbial population, which is the direct result of the substrate uptake by the microorganisms  , was accompanied by the emulsification of the culture medium as demonstrated by the increase of the E24 emulsion index during the microbial active growth phase, at all substrate concentrations tested: this suggests that the microorganisms assimilated diesel oil according to the well known mode of emulsifier-mediated transfer t  .
Maximum emulsifying activity (E24 = 82%) was obtained after 237 hours of incubation, when the consortium grows with 8.4 g diesel oil/L in the culture medium. Table 2 shows that the index decreases gradually when the substrate concentration in the culture medium increases from 1% (v/v) to 10% (v/v), what indicates that the substrate initial concentration induces inhibiting effects on the biosynthesis of the emulsifying compounds by the consortium. It should be noted that, if a single strain typically is capable of using a limited number of the compounds found in the hydrocarbons, a consortium composed of different bacteria species is usually involved in the degradation of theses complexes mixtures  . It is well known, in addition, that microbial communities may respond to varying supply of organic compounds either by physiological adaptation or by changes in the community composition. Data representing the linear fraction of the consortium growth curves corresponding to the active growth phase were used to calculate specific growth rates for each initial concentration S of diesel oil tested. Table 2 shows the results obtained for the bacterial consortium These results were then plotted versus initial concentration of diesel oil for examination of the shape of the curves developed. Figure 4 shows clearly that the bacterial community has exhibited an increasingly inhibitory response to the initial concentration of diesel oil, in accordance with the Andrews inhibitory model defined by the equation: , where is the affinity constant and is the inhibition constant. The calculated kinetic parameters from the Andrews equation for the bacterial consortium are summarized in Table 3. We can conclude that the consortium expressed a weak affinity for diesel oil and, at higher concentrations, marked inhibition effects were observed, characterized by the decrease of the specific growth rates. Surfactants are amphiphilic compounds which reduce surface and interfacial tensions by accumulating at the interface of immiscible fluids. Most of these surfactants are petroleum based and are chemically synthesized. However the leading trend towards using environmental friendly technologies has enhanced the search for compounds of bacterial origin that act as emulsifiers and surface-active agents and having the abilities to reduce significantly surface tension of aqueous media: such microbial compounds are classified as “biosurfactants”. Biosurfactants are becoming important biotechnological products for industrial applications due to their environmental friendly nature, low toxicity, biodegradability and effectiveness at a wide range of pH and temperature values. Most biosurfactants, like synthetic surfactants, exhibit physicochemical properties such detergency, emulsification, de-emulsification, foaming and wetting. Interest in their potential applications by various industries has significantly increased recently. The CMC is defined as the concentration of a surfactant at which the surface-active ions or molecules in solution associate to form larger units, called micelles. The CMC corresponds to the point beyond which the concentration of single molecules of surfactant remains relatively constant. The CMC is commonly used to measure the efficiency of surface-active agents. To obtain a measure of the CMC of our crude extract, the product was diluted in a serial dilution in distilled water, and the surface tension was measured for each dilution. The plots of the logarithmic crude extract concentration versus the surface tension were made: the results are shown in Figure 5. Using the program “linear fit” of the software ORIGIN 5.0, linear least-squares analyses of both the points before and the points after the break show that the minimal surface tension reaches at the point which corresponds to the intersection of the fitted lines and : resulting the CMC of the crude extract: . Table 3. Kinetics parameters determined from the inhibitory model for the microbial consortium growing with diesel oil as the carbon and energy source, from 8.4 to 84 g diesel oil/L. Figure 4. Specific growth rates µ(S) versus substrate initial concentration for the bacterial community growing with diesel oil as the carbon and energy source at the initial concentrations varying from 8.4 g/L to 84 g/L. Figure 5. Determination of the CMC value of the crude extract from the surface tension vs. concentration plot. The black up triangles spots represent the experimental data, the lines are the fitting linear curves. CMC is determined as the intersection point of the two lines. Since the crude extract exhibited a high emulsifying activity and decreases the surface tension of distilled water from 72 to 30.7 mN/m , it has the characteristics of a biosurfactant compounds. Hence, the biosurfactants produced by the consortium exhibit interesting surface active properties that can be useful in the petroleum industries, such as cleaning oils tanks, enhanced oil recovery procedures (MEOR) or bioremediation of sites polluted by hydrocarbons. This study shows that the degradation of (some compounds of) diesel oil can be performed individually by each isolate composing the consortium, especially by the strain KHA, but the bacterial community possesses a better potential for the degradation of a much broader set of diesel oil compounds, suggesting that the process is a result of interspecies interactions. Hence, the bacterial consortium possesses a substantial potential for the cleaning up of soils contaminated with hydrocarbons resulting from industrial activities related to refining, transportation and/or disposal of petroleum product. In addition, the high quality of biosurfactant compounds produced by this culture allows their use in a crude form for biotechnological applications without the need for product concentration or purification. We tank Professor Wafa ACHOUAK (LEMIR, UMR 6191 CNRS-CEA-Univ. Aix-Marseille II, CEA Cadarache-France) for the nucleotide sequence determination of the strains KHA and LHA. Kovarova-Kovar, K. and Egli, T. (1998) Growth Kinetics of Suspended Microbial Cells: From Single-Substrate-Controlled Growth to Mixed-Substrate Kinetics. Microbiology and Molecular Biology Reviews, 62, 646-666. Whyte, L.G., Slagman, S.J, Pietrantonio, F., Bourbonnière, L., Koval, S.F., Lawrence, J.R.., Inniss, W.E. and Greer, C.W. (1999) Physiological Adaptations Involved in Alkane Assimilation at a Low Temperature by Rhodococcus sp. Strain Q15. Applied and Environmental Microbiology, 65, 2961-2968.
Cooper, D.G. and Goldenberg, B.G. (1987) Surface-Active Agents from Two Bacillus Species. Applied and Environmental Microbiology, 53, 224-229. Desaï, J.D. and Banat, I.M. (1997) Microbial Production of Surfactants and Their Commercial Potential. Microbiology and Molecular Biology Reviews, 61, 47-64. Button, D.K. (1985) Kinetics of Nutrient-Limited Transport and Microbial Growth. Microbiological Reviews, 49, 270- 297.